Gentle Solutions Collagen AM; COLLAGEN protein dietary supplement which aides the body in building lean muscle. Safe and proven natural weight loss management supplement, with no harmful side effects. 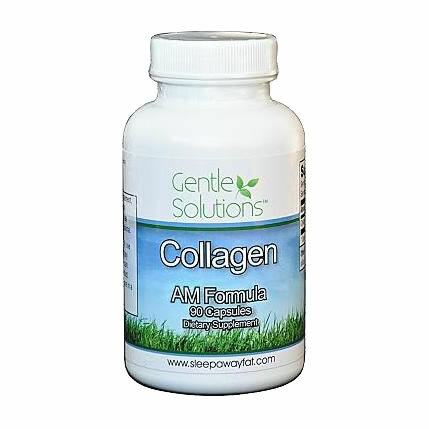 The Gentle Solutions Collagen AM weight loss formula is formulated to work in the morning and throughout the day. You simply take three capsules as soon as you get up and do not eat for an hour. You can take our Collagen AM in addition to the original nighttime solution to maximize your results. For people with complex schedules, we offer a combo package of our AM & PM formulas. One of each bottle included for you to best suit your lifestyle. This product fits my lifestyle so easily, it\'s priced right and has been instrumental in helping me to lose those 15 pounds! I feel great, people comment on how much younger and thinner I look and I love it! I have been taking just the Collagen AM supplement for the past 3 months. It was during the Holidays and I still managed to lose 17 pounds with the Collagen AM formula alone! I love this product, can\'t say enough about it. Chris Mitchell is right it really does work! I have been on am and pm for 3wks and have lost 2 inches on my waist and 4#-I am happy with the results thus far-I haven't been able to loose weight otherwise.